PF-360 is a high-performance nano-self-cleaning agent of fluorosilicone resin, which is mainly used for surface treatment of 3C industrial glass such as mobile phone screen. The active ingredients of the product can form nano-scale ultra-thin transparent coating on the surface of the substrate, which has excellent waterproof, oil-proof, easy cleaning and corrosion-proof functions. 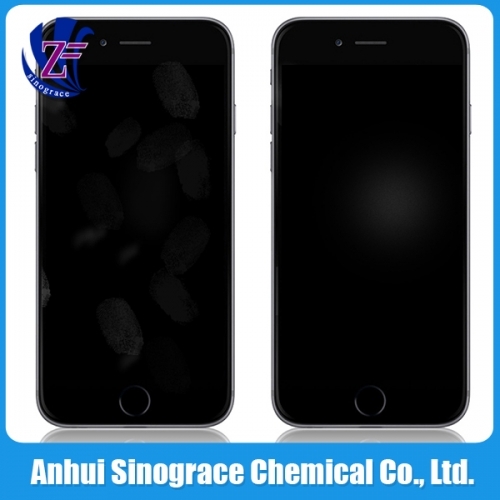 iPhone Screen Anti-fingerprint waterproof coating PF-360 iPhone Screen Anti-fingerprint waterproof coating is a high-performance nano-self-cleaning agent of fluorosilicone resin, which is mainly used for surface treatment of 3C industrial glass such as mobile phone screen. The active ingredients of the product can form nano-scale ultra-thin transparent coating on the surface of the substrate, which has excellent waterproof, oil-proof, easy cleaning and corrosion-proof functions.